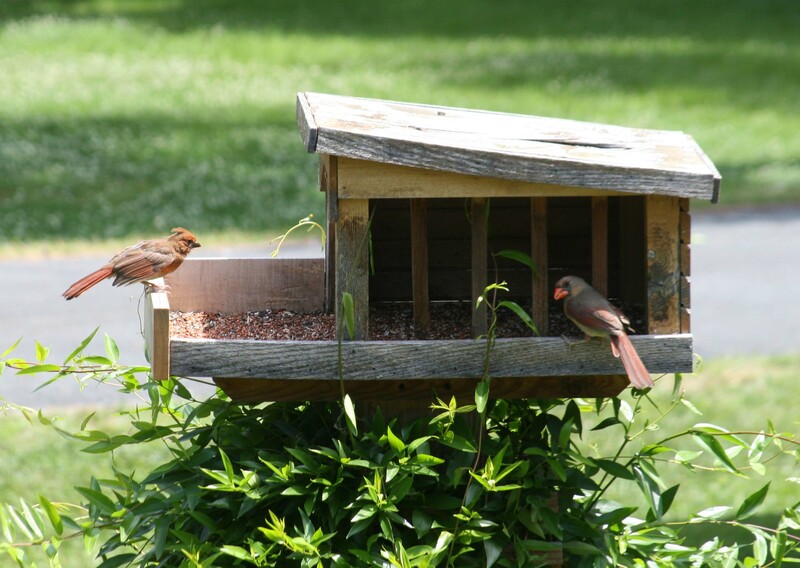 There have been a pair of Cardinals calling our yard home for the past month or so. We have watched and tried to find their nest but they have been good at keeping it a secret. Today I was working in the den and heard a racket in the front yard, I ignored it for a while. After about ten minutes my head started to pound so I went to see what was causing the noise. I found the mother cardinal with one of her offspring in our bird feeder. The baby was constantly chirping, demanding to be fed. Mother would pick up a few seeds and put them in the young birds mouth. After a little while the father showed up, chased them both off…it looked like he was trying to get the young bird to try and fly. I went back to work and about ten minutes later recognized the same racket outside as the mother and baby cardinal had returned. I got some okay pictures through the living room window.